In episode 24, I talk to Theresa Vigarino. Get set to break free from your limits, quit negative self talk and heal the wounds of your past. Theresa shares a secret, that our brains are trying to keep us stuck. In order to change your behaviour and responses to triggers, we need to rewrite the story. Theresa shows us how in this latest episode. Theresa is a Certified, Professional Life Coach with a speciality in trauma and grief recovery. She has coaching graduate work in the study of neuroscience, quantum physics and spirituality. She is also a spiritual teacher, author and speaker. She is a mother of 2 grown children, recently engaged and resides in Lake Tahoe, Nevada and Silicon Valley/Bay Area, California. She enjoys activities in nature, is an avid rock climber, gourmet cook, lover of life and social butterfly. She loves her time with her friends and family in Lake Tahoe. Theresa coaches and teaches women in mid-life how to create the life of their dreams. Currently, she is working with women on healing their hearts, minds, emotions and spirit in the area of romantic love. She teaches a 5-day intensive class, Transformation Through Healing. She coaches one-on-one, and is planning a retreat in Lake Tahoe in October 2015 for women. The brain will not give up an old way of thinking or being until it has a new one to go to. It’s the workings of our own mind that keep us trapped. Our brain records our life story. Know what your triggers are. When we are trying to form the new story, our brains will try to keep us the same. Self-acceptance is a gift we can give ourselves. Focusing on the negative will keep you from doing what you want. Fear will keep you trapped. We have to get away and clear our our weeds out. Tip: Embrace the fear and be comfortable in the uncomfortable. Your gifts are meant to be shared. Live your life with the expectation of the miraculous. 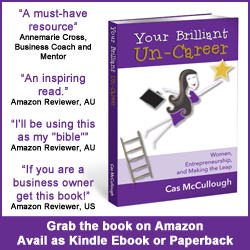 Chapter 11 of Your Brilliant Un-Career talks about mindset and overcoming barriers to success. I have done a terrific interview with EFT practitioner Sally Thibault on this topic that I want you to have. Access this interview for free here, along with 32 other business building podcast interviews, templates, worksheets and motivational affirmations.